Early morning at Pelican Point and the sea is seething with seals. I’m surrounded by them. They’re arching through the water all around my kayak, scratching with their flippers, playing with the paddle, diving with a wave of their tails. This amazing aqua choreography is being performed to an unusual soundtrack; a cacophony from the nearby beach, black with the bodies of yet more seals. It’s astonishing in volume and tone, like listening to a huge flock of sheep. Blimey, if this is only half-full, what’s it like with the full quota? “I think this is the cutest thing I’ve ever done,” an American tourist rhapsodises. I can’t help agreeing. Of all the animals I expected to be wowed by in Namibia, home to the big five, this was not one of them. I thought we’d, er, see lions, not sea lions. Yet it turns out to be just one of many surprises in this great wilderness of a country — four times the size of Britain, with two million inhabitants — wedged on the Atlantic coast between South Africa and Angola. It’s certainly the cleanest, easiest, safest place I’ve visited in Africa. There’s drinking water from the tap, plenty of stomach-upset-free fruit and veg, and good roads across the country (much of which is malaria-free). They even drive on the left. The town of Swakopmund, where we head after our kayaking expedition, is perfectly safe at night to walk to superb seafood restaurants such as the Tug and Ocean Cellar. Here we feast on main courses for about £8 each. 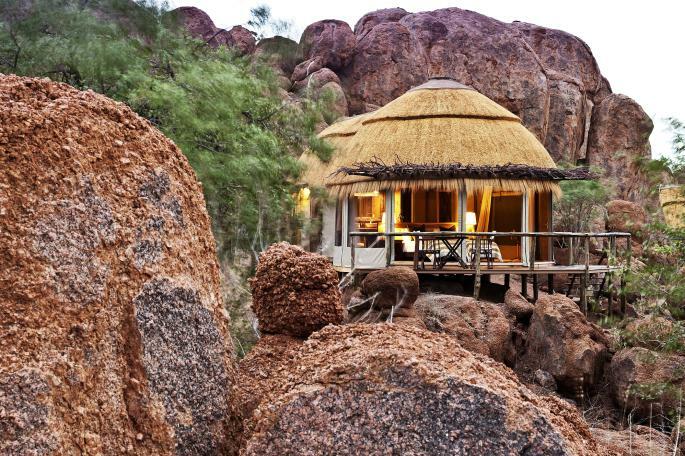 And that’s perhaps the biggest surprise of all about Namibia: the price. Because the Namibian dollar is pegged to the rand, you’ll still get about 17 to the pound, considerably better than lows of ten in 2010. 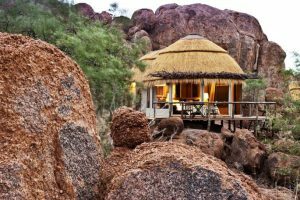 It doesn’t take my ten-year-old son and me long to work out that, while Namibia is Africa-light in terms of ease, and perfect for a family holiday, it also offers everything traditional safari destinations have — fantastic wildlife, luxury lodges — in a much more spectacular setting. This whippersnapper of a country (it gained independence from South Africa in 1990) is geologically ancient, with magma and sediment trapped in a rocky time warp that has left huge red boulder fields and giant sand dunes rippling right down to the coast. We get our first taste of the startling emptiness of it all in the 600,000-acre NamibRand Nature Reserve, an hour’s flight from Windhoek. At Wolwedans, the window of our luxury tent makes the perfect frame for the ever-changing picture that is the Namib desert, glowing red at midday, mellowing into softer hues as the shadows lengthen, forming a palette of ochres, blacks and oranges. Here days pass on gentle drives among oryx and dung beetles, pondering the origin of fairy circles of grass or gazing at herds of grazing zebra and troops of baboons clambering over rocks. Before you know it, it’s time for sundowners among the dunes and a delicious meal of oryx steak followed by stargazing round the camp fire. 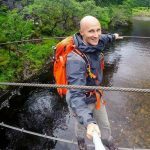 There’s no big game — the scenery is very much the star of the show — but it’s the perfect place to rediscover your soul and just be. It’s just a precursor, though, to the incredible dunescape of Sossusvlei, which we fly over en route to Swakopmund. What look like great swirls of sand from the air reach the height of a 60ft building, pouring down to the coast. If there is a regret on this amazing trip, it’s that we don’t see these dunes from the ground. We have other places to be, however, and we set off from Swakopmund with our driver and guide, Jimmy, on a northerly circuit that takes in Damaraland, with its rock paintings and desert elephants, the safari park of Etosha, and on to the big cat reserve of Okonjima, much beloved by that newly extinct species, Brangelina. Many people do traditional self-drive tours, but I’m not a fan of getting a puncture in the middle of nowhere — more of which later. So, with Jimmy at the wheel, we head off into Mad Max scenery, past the massive Brandberg monolith, at 20 by 15 miles Namibia’s version of Australia’s Uluru. It’s four hours of great views all the way to Damaraland, a wild, rugged area of rust-red rocks where Martians would feel right at home. While there’s no evidence of extraterrestrial activity, ancient bushmen have left their mark at Twyfelfontein in a series of impressive engravings. Giraffes, elephants and oryx were etched into the rock here up to 6,000 years ago, along with seals and penguins. Traditional communities still inhabit Damaraland, including the Himba tribe, whose women carry out a fascinatingly long daily beauty ritual, which eschews bathing with water in favour of a body coating of ochre mixed with animal fat. They finish this inimitable look with loincloths, hair extensions and goatskin headdresses. We get a chance to see all this in a Himba village in the middle of nowhere, but it feels touristy, especially when the villagers put on a dance round a donation pot and take us to a market put on just for us, with highly inflated prices. We prefer less voyeuristic glimpses of local culture: the hotel receptionist speaking on the telephone in the local click language and the sight of Herero women gliding around in town, wearing Victorian-style dresses that they adopted from the missionaries. There’s some unique wildlife in Damaraland too, in the desert elephant, which have large feet for walking on the sand, long, thin bodies and short tusks. We drive up a dry riverbed to find them and it’s not long before we meet a herd, some with babies only three weeks old. In a performance I could have watched for ever, one of these clambers repeatedly on the sleeping, prostrate body of its sibling, nudging it with its trunk, urging it to wake up and play. There’s more big game at Ongava, a private reserve at the edge of Etosha National Park (and the only part of our trip where we need malaria pills), reached along roads fringed with grazing giraffe and cantering ostriches. Here, at Andersson’s Camp, we are just settling down to a delicious dinner when a pride of 16 lions pads up to the adjacent water hole. Food is forgotten as we dash oh-so-silently to the camp’s hide, reached by a tunnel that takes us so close we can hear them slurping away at the water. It feels special to be so near — until a male lion roars at a child who galumphs into the hide and we jump back in fear. Although there’s time to explore the safari park of Etosha (whose name means “great white place”, from its seemingly endless pan of silvery sand), we prefer rattling around the 70,000-acre private reserve of Ongava. Here, after finding yet more lions (“There’s one doing a poo!” yells my son) we sip sundowners about 25m from a group of seven rhinos as the sun paints Africa in its best colours. Back at camp, the lions roar by the water hole all night. There are big cats at Okonjima, a reserve for cheetahs and leopards, but first come the dogs — three wild ones under a tree. They may look cute, but don’t be fooled; these creatures snap chunks out of their prey as it flees, eating it alive. And so to the cats. Namibia has about half the world’s population of cheetahs, at 3,000, and double that number of leopards. They roam free, but many are collared and protected by the Africat Foundation. As we drive into the bush with a guide who is intriguingly called Previous, he has one hand on the wheel, the other holding an aerial as we listen to the mounting “beep, beep, beep” submarine-like sound. We chalk up several sightings, snapping our selfies with leopards in the background. Then, the submarine beeping goes wild as our vehicle heads across a dry riverbed, uphill and into an overgrown area of bush, where the acrid smell of rotting meat hangs in the air. 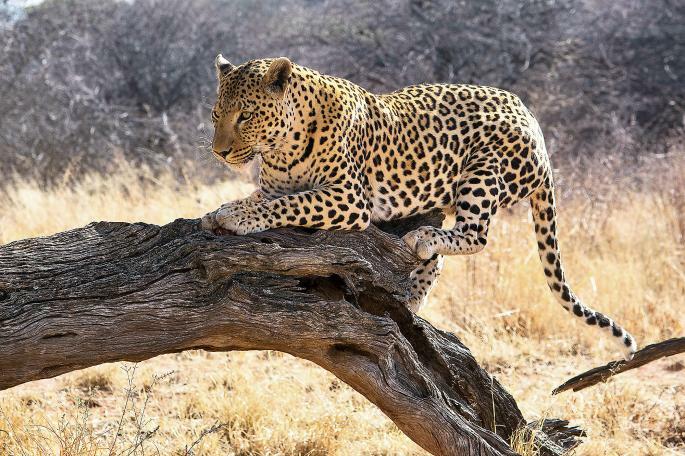 There we spot a female leopard, tail swishing in the air as she eats, although it proves to be a mere Scooby Snack and she leaves, still hungry. So do we. Or at least we try to, but as we reverse over branches and prickles back on to the sandy riverbed, a puncture announces itself with a whoosh. We’re stuck there, immobile, with the hungry leopard lying on the ground, watching, waiting, well aware that we have children in an open Jeep. Previous is quick to act, telling us in hushed tones that under no circumstances must we leave the vehicle — before getting out himself. Changing the tyre at double-quick speed, while a wary Jimmy stands guard armed with a stick, he looks up at us with a relieved grin. “Welcome to leopard trekking,” he whispers. It’s another moment of pure animal magic in this most surprising of countries. Cool and contemporary, the Olive Exclusive is a great place to stay after the long flight via South Africa. 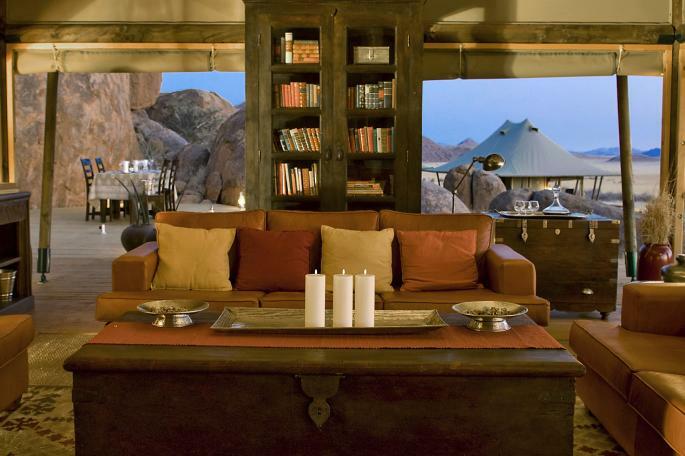 There are just seven suites, each done out to reflect a different region in Namibia, with lots of rough-hewn wood, bare stone and throws. Four rooms come with a plunge pool and great views over the valley. The wooden and canvas tents at Dunes Lodge are beautifully kitted out like rustic-chic hotel rooms. There are four-posters and posh linen, en suite bathrooms and fresh, tasty food, but the real star of the show is the scenery. 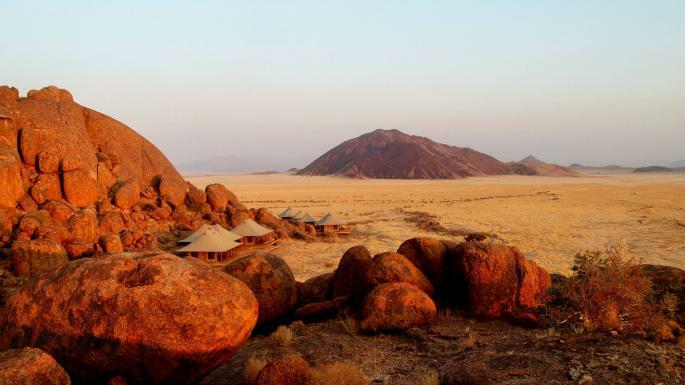 Stay at Dunes Lodge for the expanses of colour-changing sand, or book into the more exclusive Boulders, with just four tents at the base of massive granite rocks. Tent No 1 even has its bathroom tent tucked beneath a giant boulder. There isn’t a better place to enjoy a sundowner, gazing out over the spectacular scenery, than at Mowani Mountain Camp with its rounded thatched domed tents scattered among giant boulders, the highest of which makes a great perch as the sun slips slowly down, along with the beer. The rock pool is lovely too. It looks like a bland motel from the outside, but this modern hotel is delightfully quirky inside, with unusual light fittings and lots of splashes of colour among the bare wood floors. There’s a buzzy bar, reception staff are really helpful and breakfasts are good, as is the wi-fi. The tented cabins, made from reclaimed materials, are very simple — and get very hot. However, it’s worth staying here for the amazing water hole and hide, the fantastic food, and because you get access to the private game reserve of Ongava. This modern, sprawling camp is the least atmospheric of the safari camps we stayed in, and the food was reminiscent of a school canteen, but the rooms were very comfortable, with huge bathrooms and a picture window.